My 8'er is a 5 finner. Haven't had it too long but have not really found a comfortable fin setup yet. After the recent thread by legion in the short boarders forum Iv been googling alternative quad setups. The standard setups have kind of felt a little twitchy, and I felt like I was trying to surf it like a shorter board, which didn't really work. So I swapped the front and back fins out, something I saw on McKee site. Stated more drive, more drawn out turns. I love a 2+1 setup so I tried it this morning. Felt alright. Less twitchy and yeah, felt like it surfed more like an 8'er should. Gx in front, and some standard template 4.5 plastic ( :0 ) sides. Anyway, How do you setup your longer quads? Quads generally make a board surf longer, if you've got the rail length you don't normally want that. Yeah, I prefer 2+1 on longer boards but I bought it second hand. I'm tempted to get a single fin box put in it professionally. Anyone tried those long keel finned boards that are kinda in fashion at the minute? I had a finbox put in my quad egg when it was in for repairs. Was a revelation. Fighting it out for my best midlength ever with the DVS full carbon/eps 8'er is my Woosley 7'6" vquad. Deep double concaves and teamed with the Webber flex fins....yeeeeew! Is that a full set off the Webber diamond ? Soar fins? Yep Soar. I just contacted Greg through his email address on his website and had him send me them. You can contact Soar direct and buy them. Not on their website though. I've yet to run it with only one rear fin in the thruster plugs but use it like that in my DVS weiner 6'3" since it just has thruster plugs and it works great. Next time I surf it I'll use it as a thruster with the Soars. 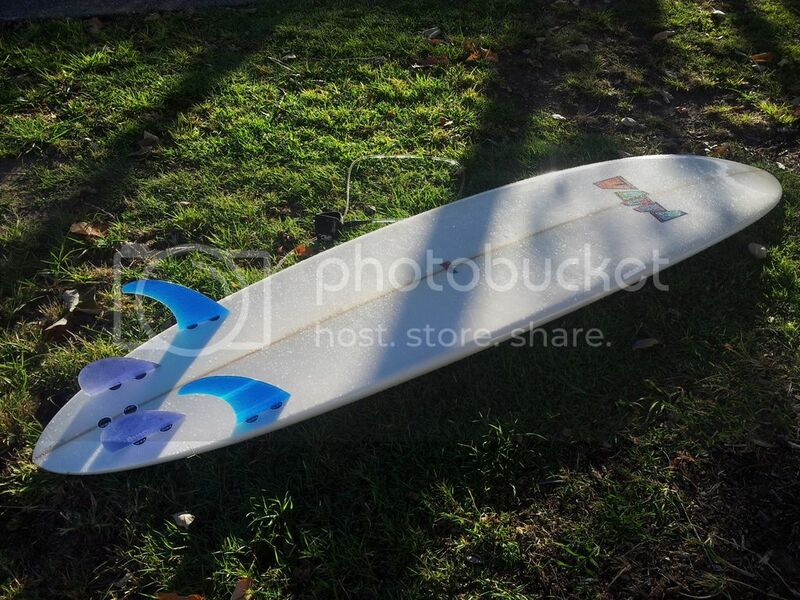 The board goes really well with a set of Scarfini med quad fins for a more conventional feel. I'll normally use large quad fins or twin/small trailer combos in my shorter quads but since there's so much rail to use in the 7'6" it doesn't need large fins...just stiffens the board unecessarily. Last edited by Cuttlefish on Sat May 07, 2016 8:06 pm, edited 2 times in total. I've got a quad set up on my desert storm 7'6" and it feels smooth as butter on any size wave. The guns used @ Mavericks and Waimea have featured quad set ups for ages.They are probably the longest boards to use them.Camel uses them on the big DSs he charges on. Ive successfully ridden a few longboards with quad set ups too, I put the bigger(twin size)MRs in the back plugs to help noseriding. How does the Dessert Spoon go in mallet stuff Steve? Beanpole wrote: How does the Dessert Spoon go in mallet stuff Steve? I emailed outer islands about changing it to a single fin box. Straight forward and can be done so will head out this week and see if I can get someone to change it over for me. I can use huies fin, though it might be a bit small. If so I'll get a bigger one, maybe 8"
Well it was supposed to be smaller stuff.